I haven’t consciously marked many milestones in my life as a home cook. My learning curve has unfurled slowly and gradually: a day comes when something I used to struggle with suddenly feels like habit, or I realize that a process I used to dread is no longer a big deal. Many of these moments have had to do with baking, simply because it’s more technical and less intuitive (for me) than cooking always has been. 2017 has been the year of bread. I started making my own bread regularly for the first time in my life, inspired by Alexandra Stafford’s amazing Bread, Toast, Crumbs, and then spurred on by The New Laurel’s Kitchen (which is full of good instruction). I’d feared homemade bread-baking for years, intimidated by overly technical advice and anxieties about whether I’d have the right sense of timing and intuition. This year, I’ve learned that, to quote Julia Turshen, “yeast is just an ingredient,” and there’s nothing so scary about kneading or shaping dough. I’ve come to love the feel of dough in my hands. I love sitting back and watching it do its thing: resting, rising, and turning a deep golden shade in the oven. Bread baking found me at the right time. I started cooking from Ali’s book just as I was processing the loss of a long-term relationship. I was bereft, and baking kept me company. It gave me something to do, and it presented me with a constant series of new challenges, each satisfying yet incremental enough enough to be manageable. Most of all, it gave me bread. Loaf after tender, fragrant loaf. I can’t think of too many things that I cam as consistently happy to eat than bread or toast, and all of the things you can serve with them (dip, soup, etc.). Through all of this, I’ve told myself that yeasted breads are within my reach, but sourdough isn’t for me. Sourdough is for serious bread bakers, those who know the ins and outs of autolysing and levains and scoring and hydration. I follow countless sourdough Instagrammers, but to some extent that has only made me more intimidated, rather than less. Still, I haven’t been able to shake the itch to give sourdough a whirl, and the work of many women—Cheri Litchfield and Sarah C. Owens among them—has given me the ongoing encouragement I need. It was Cheri who reminded me that, no matter how technical sourdough-making can be, it’s also a time-honored method that home cooks have been practicing for hundreds of years. I’ve known this for a while, but I needed someone to walk me through it—a warm, friendly, accessible guide. Enter Emilie Raffa. 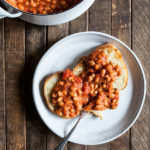 You might know Emilie as the author of the Clever Carrot blog, where she shares wholesome and hearty comfort food recipes. She’s also an accomplished bread maker, and her new book, Artisan Sourdough Made Simple, is a loving tribute to the ins and outs of bread making. It is the most accessible, down-to-earth resource I’ve ever seen about sourdough (having purchased and left dormant a number of much more technical books). I have Emilie to thank for the fact that, as of last week, I’ve been baking fresh sourdough every other morning, tearing it into hunks and dipping it in soup, using it for toast, slicing it up for sandwiches, and sharing gleefully it with my neighbors and friends. 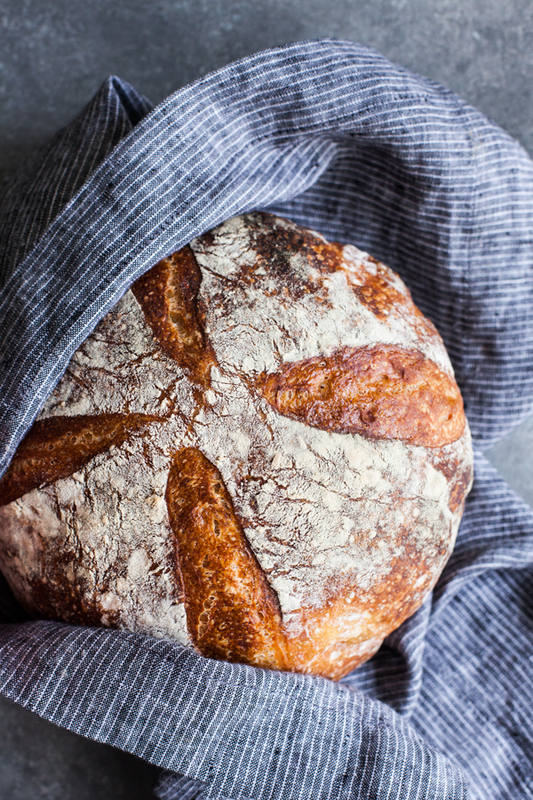 It’s hard for me to say how gratifying it has been—not just the amazement I felt when I realized that I could do it, but also the sensation of empowerment that baking one’s own bread can bestow. It’s so gratifying to create a staple food from nothing but flour, water, and salt. I see more than ever why the process becomes so intoxicating over time. And I see that sourdough isn’t a project for master bakers. It really can be simple, intuitive, and fun. I’ll be sharing Emilie’s foundational recipe for everyday sourdough in this post, along with a tasty dip to dunk your slices into. But I want to emphasize that the whole book is invaluable, especially if you’re new to sourdough. Emilie walks you through every step of the process, including creation of a starter, with simple instructions and useful cues. If you want to start baking regularly, you’ll want to read everything she has to say. And reading it won’t overwhelm you. This book is neither dense nor dry. Emilie is happy to leave out certain techniques or terms, assuring readers that they don’t need to know everything about sourdough in order to get started. She gives you exactly as much information as is necessary for beginners. I don’t doubt that I’ll keep wanting to learn about this process, but as a novice I felt so grateful that Emilie was able to help me separate the essentials from the graduate level stuff. Along with the book, Emilie shared with me a package of her dried starter, which is named Dylan, after her son. Dylan is the offspring of Priscilla, a robust starter that Emilie’s friend Celia shipped to her all the way from Australia years ago. Starter, she says, is meant to be shared. Using Emilie’s dried starter means that I didn’t need to grow my own from scratch; within 3 days, I had a jar that was well-fed, bubbly and ready to go. At the end of today’s post, after the recipe, I’ll be offering a chance for a US reader to win a copy of the book and a package of Emilie’s dried starter. Together, they’re everything you need to get started with your own loaves. 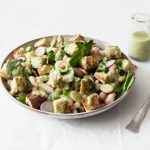 For now, though, I want to share Emilie’s incredible, practically no-knead everyday sourdough recipe, along with her zippy, garlicky, oh-so-simple recipe for white bean arugula dip! Every baker needs an all-purpose, go-to loaf in their repertoire. 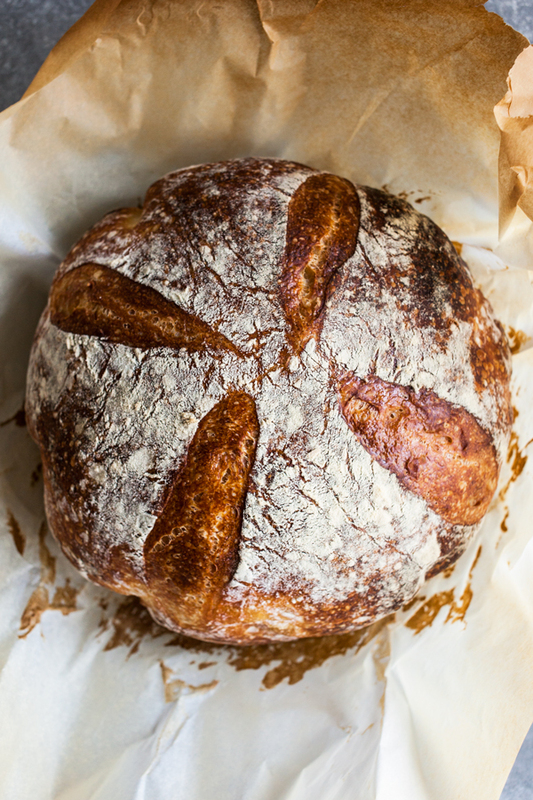 And if you’re new to sourdough, this is the perfect place to start. Simply make the dough, let it rise overnight, and bake in the morning. It requires very little effort with big reward. The crust is golden and crunchy, and the velvety crumb is perfect for sandwiches and toast. Try a few thick-cut slices with creamy avocado and tomato or the most delicious grilled cheese sandwich you will ever sink your teeth into. This is my family’s favorite loaf. Thursday–Saturday: Feed your starter until bubbly and active. Sunday Morning: Shape the dough let rise again, score, and bake. Make the Dough: In the evening, whisk the starter and water together in a large bowl with a fork. Add the flour and salt. Combine until a stiff dough forms, then finish mixing by hand to fully incorporate the flour. The dough will feel dense and shaggy, and it will stick to your fingers as you go. Scrape off as much as you can. Cover with a damp towel and let rest for 30 minutes. Replenish your starter with fresh flour and water, and store according to preference. After the dough has rested, work the mass into a fairly smooth ball. To do this, grab a portion of the dough and fold it over, pressing your fingertips into the center. Repeat, working your way around the dough until it begins to tighten, about 15 seconds. Bulk rise: Cover the bowl with a damp towel and let rise overnight at room temperature. This will take about 8 to 10 hours at 70°F (21°C). The dough is ready when it no longer looks dense and has doubled in size. Shape: In the morning, coax the dough onto a lightly floured work surface. To shape it into a round, start at the top and fold the dough over toward the center. Turn the dough slightly and fold over the next section of dough. Repeat until you have come full circle. Flip the dough over and let rest for 5 to 10 minutes. Meanwhile, line an 8-inch (20-cm) bowl with a towel and dust with flour. With floured hands, gently cup the dough and pull it toward you in a circular motion to tighten its shape. Using a bench scraper, place the dough into the bowl, seam side up. Second rise: Cover the bowl and let rest for 30 minutes to 1 hour. The dough is ready when it looks puffy and has risen slightly but has not yet doubled in size. Preheat your oven to 450°F (230°C). Cut a sheet of parchment paper to fit the size of your baking pot, leaving enough excess around the sides to remove the bread. Score: Place the parchment over the dough and invert the bowl to release. Sprinkle the dough with flour and gently rub the surface with your hands. Using the tip of a small, serrated knife or a razor blade, score the dough with the cross-cut pattern on page 195, or any way you’d like. Use the parchment to transfer the dough to the baking pot. Bake: Bake the dough on the center rack for 20 minutes, covered. Remove the lid, and continue to bake for 30 minutes. Then, carefully remove the loaf from the pot and bake directly on the oven rack for the last 10 minutes to crisp the crust. When finished, transfer to a wire rack. Cool for 1 hour before slicing. Sourdough is best consumed on the same day it is baked. To maximize freshness, cool completely and store at room temperature in a plastic bag for up to 1 day. About the Dough: Because this dough rises while you’re asleep, you won’t be tempted to rush the process or check on it every five seconds to see if it’s ready. Have a look at the baker’s schedule, then make adjustments to suit your own schedule. The overnight method can be applied to most of the recipes in this book. 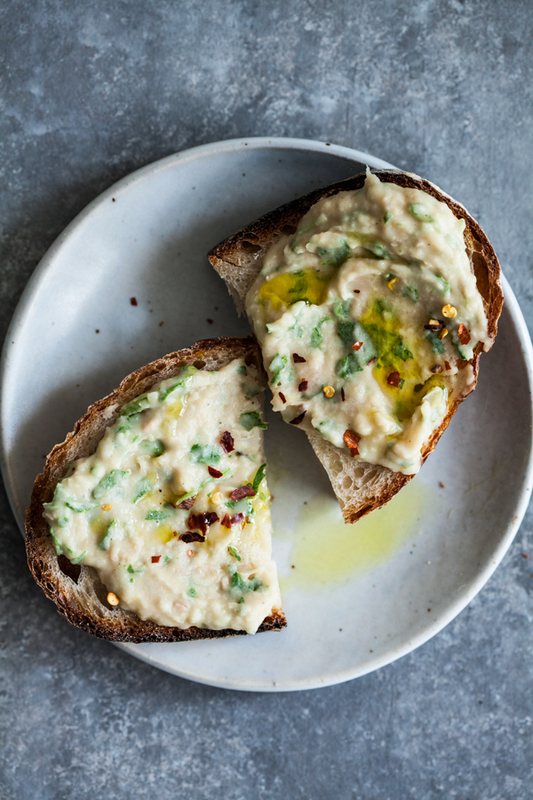 This creamy white bean dip with baby arugula is the perfect destination for a slice of artisan sourdough. It’s not only healthy, but it’s incredibly simple to make—just pulse a few times in the blender and you’re done. Add the beans, arugula, olive oil, garlic, red pepper, zest, and juice of half the lemon to a blender. Season generously with salt and pepper. Pulse a few times to combine. The texture should be creamy and rustic. Taste the dip and adjust with more lemon juice or salt and pepper if needed. Transfer the dip to a small bowl and drizzle with extra olive oil and red pepper flakes. Arrange your sourdough slices on the side, to serve for dipping. You can also use fresh parsley or cilantro leaves in place of the arugula. Clearly, I’m over the moon about Emilie’s bread—not just the signature Everyday Sourdough, but the many other incredible loaves in this book, including Seeded Pumpkin Cranberry, Roasted Garlic and Rosemary, and Danish Rye Bread. But it’s worth saying how awesome this dip is, too. It’s the kind of thing you can whip up in mere minutes if you’ve got a can of beans and a handful of bitter greens or herbs, certain that your friends or whoever’s coming over will polish it off. The creaminess of the beans and olive oil are offset by the bite of garlic and pepper, and the dip is so much more complex than its simple preparation would suggest. If you’ve thought about sourdough but haven’t known where to begin, this is the book for you. And even if you’ve never made bread before, it’ll give you all the tools you need to understand the process. What Emilie teaches you will serve you with any type of bread-making, and her assortment of recipes (which span not only breads, but also crackers, rolls, desserts, and savory meals) will give you plenty of ideas about what to do with all of the marvelous loaves you’re making. Enter below to win a copy for yourself. I’ll pick a winner two weeks from today! As I said, bread making has found me at the right time, and I'm so excited to continue learning and sharing about the process. 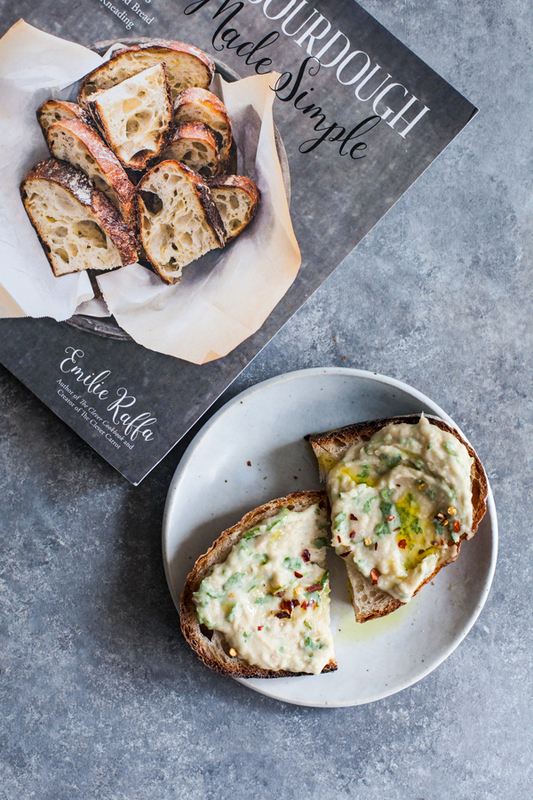 Perhaps Emilie's work will inspire you to consider making sourdough at home, as it has inspired me—and if not, I hope it'll encourage you to pick up a loaf of bread from your local baker and slathering it with some creamy white bean dip. Enjoy the recipes, and see you this weekend for the roundup! So inspiring! I haven’t made sourdough bread in a while. After reading this I might have to. Often I can’t bring myself to add anything to fresh bread besides some really nice salted butter, but if I’m feeling fancy, tahini and tomatoes are a nice combo. Sorry, but I’m a purist– either plain bread or just butter or apple butter does it for me! Sourdough has always been scary to me but this sounds doable and amazing! Thank you for the recipe and for a chance to win this wonderful looking book. I’ve been looking for a simple sour dough recipe! I bake a lot of breads, but I’ve always avoided sour dough because of the starter. Thanks for sharing! I want to start baking bread so badly! It’s been such an intimidating conquest throughout the course of my home cooking… Hopefully this will allow me to conquer and enjoy baking bread. We top our sourdough with avocado and kimchi! I started a small tradition a few months ago, I go to mass by myself and every Sunday after mass I stop at our neighborhood bakery and buy two sourdough half-baguettes for my husband and me, and when I get home he prepares the sandwiches. Last Sunday my husband arrived from a trip and he was so excited about his sourdough sandwiches that he even commented on the phone before taking his plane. On Sunday morning, to my shock, the last two half-baguettes were sold to the person in front of me…we were both so disappointed lol. I love making bread, but I haven’t dared to try making sourdough, I should probably change that. I’ve been thinking about making sourdough for a while too and this is the prompt I needed. I’m going to go for it! Can this be made as whole wheat?? If it can I am sold! I have also been wanting to make sourdough for years after hearing how it increases absorption of nutrients, but didn’t know where to start! My favorite dip is the black bean orange dip in Dreena Burton’s Eat, Drink, and Be Vegan. So good! A lot of her dips are really good! I’d recommend following this recipe as is, but the book contains whole wheat options! I used to bake bread, but it’s been years. I’ve always loved sourdough, but have been too afraid to try it, but you make it sound so do-able! I love a nice loaf dipped in olive oil and balsamic vinegar. Yum! This looks delish! I love good smashed avocado or hummus on bread, but frankly, I love bread and eat it mostly plain! These recipes look amazing. I’d love to try baking my own sourdough but have always been too intimidated! I love to put avocado or guacamole on my toast. Then through on some pepper, nutritional yeast, and salt. So good. I also love earth balance and sliced radishes with salt sprinkled on top. You did it-hooray!! I love how you set your mind to do something and then follow through with determination to the end. I am so impressed. Your bread looks absolutely perfect! And your scoring- beautiful and amazing. Your dip sounds delightful and together with the bread would make a perfect lunch just about any day of the week. This looks so good!! My favorite thing to dip fresh bread in is olive oil with za’atar. Mmmmmm!! 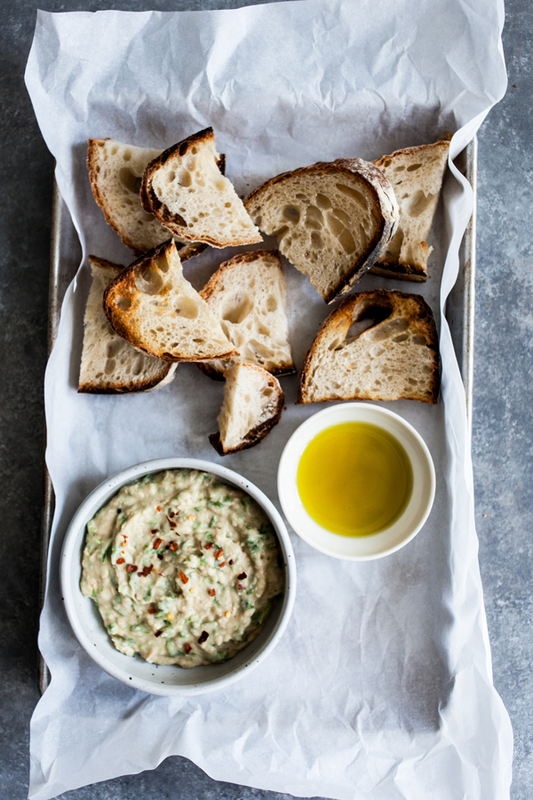 I love bread spread with a garlicky white bean dip! 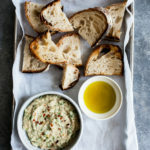 Gena, thank you for sharing Emilie’s sourdough and dip recipes. I love hummus and smashed avocado on bread :). I probably have only tried making my own bread twice in the past (I attempted a couple of recipes from Peter Reinhart’s Whole Grain Breads, which I picked up a few years ago), but perhaps this will get me to give it another try :). Hummus is my favorite dip for bread. Jam is good too. Love a good avocado pesto on sourdough! I too have been intimidated by making sourdough bread. Maybe I should give it a try? I usually go for smashed avocado! Thank you for the recipe, I would love to try and make this sourdough but I am confused where the recipe for the starter is, I don’t have anyone that can share theirs with me. My favorite spread for bread right now is pure tahini with a little cracked pepper and salt and packed with lettuce, cucumbers, peppers and radishes. I love the smell of fresh baked bread. It takes me back to memories of my Grandma baking sourdough in her kitchen. Nothing beats that sound of tearing into that crunchy crust. I love sourdough bread! Is there a whole wheat recipe in the book? This post put me over the edge. Going to have to start the process! I’ve been toying with the idea of starting a sourdough culture – but this recipe has me a bit confused about a “baking pot”. I understand the role steam has in creating a great loaf, but what does one use as an oven safe pot? The dip looks deeelicious! Can’t wait to dive in and give this a try! A 5 or 6 quart Dutch oven with a lid will work perfectly! That’s what I use. I’ve been dying to try my hand at sourdough for ages and I’m out on maternity so I think this fall might finally be the time. I love hummus or avocado on bread! I was never strictly gluten free. I’ve gone through periods of seeing if avoiding it would make a difference for me, and one of those was recommended by my GI, but only as an experiment. Ultimately, avoiding gluten didn’t make a discernible difference, and my GI health has been strong for a while now. So, I regularly enjoy wheat-based foods! I love spinach dip! The kind you find in a hollowed out round sourdough bread. Black Bean Hummus dip is my fave. Miyoko’s made this amazing garlic butter that would be fantastic! As for a dip hummus would be delicious! I’m making this recipe right now! I started my sourdough starter, Jacques (A Tale of Two Cities/French Revolution reference), last week during the mini SoCal heatwave. The weather is a lot cooler now, so it’s time to bake, woo! Nothing beats simple earth balance! Fresh bread is too good to cover up with anything else! I love nut butters and honey on fresh bread! I love olive tapenade for spreading on fresh bread. Looks like a great recipe, can’t wait to try making it over the weekend! sourdough is my favorite and i’m learning how to bake my own loaves right now too! i love olive tapenade to top a crusty yummy slice. Good quality extra virgin olive oil for me! 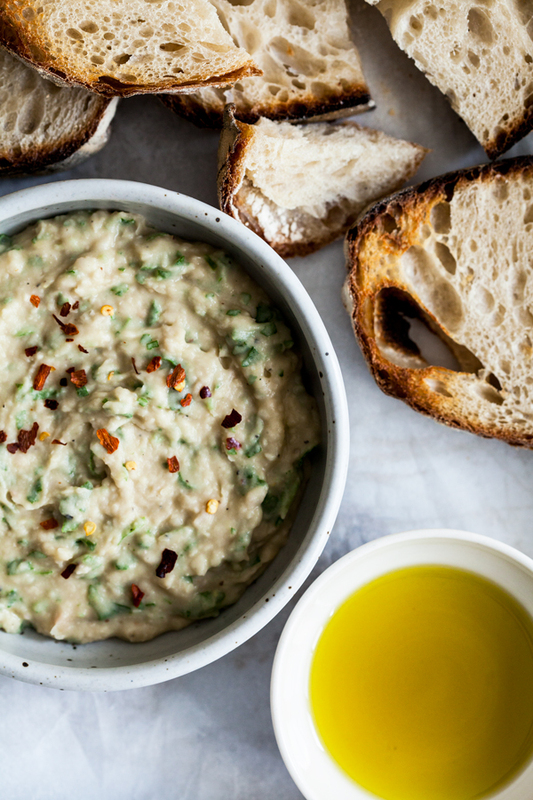 This white bean dip looks like it might be my new favorite topping! But you can’t beat good olive oil, balsamic and salt.